If you’re a SEMA Show exhibitor, product exposure is the name of the game. Your number-one goal is attracting buyers and media to your booth, where you can discuss and demonstrate your new and featured products in person. If, on the other hand, you’re a buyer or media attendee, your priority is saving time and legwork in discovering the latest and greatest product innovations amid more than a million square feet of booths and exhibits vying for your attention. Fortunately, there’s an efficient solution for everyone: The SEMA Show’s New Products Showcase. The SEMA Show is the world’s most impressive automotive trade show. It draws industry professionals from around the globe to stunning exhibits of innovative and sought-after specialty-equipment products. It attracts more than 135,000 industry leaders from more than 100 countries to Las Vegas, all seeking business opportunities in the automotive, truck and SUV, powersports and RV markets. And the 2013 SEMA Show—the year of the association’s 50th anniversary—will eclipse all previous gatherings. In fact, exhibit space in the Las Vegas Convention Center (LVCC) is sold out, and new display areas have been created in the Las Vegas Hotel and in other parts of the Show grounds to help accommodate the surplus. Tom Gattuso is the director of the SEMA Show. With more than 18 years in the field of automotive-event production—both consumer and trade—he is well versed in ensuring that attendees and exhibitors of every stripe receive the greatest return on their investments. 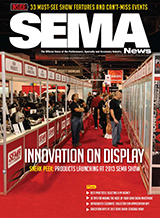 The 2013 SEMA Show will be his third as director, and SEMA News was pleased to talk with him about his insights. As the specialty-equipment industry’s premier trade association, SEMA relies on elected volunteers to serve on its Board of Directors and in positions of council leadership. Representing every segment of the automotive aftermarket, these industry professionals are dedicated to the advancement of marketing, regulatory and business standards and practices that promote industry growth for all. In short, they are on the front lines identifying challenges and opportunities facing the industry and crafting policies and programs to address them. To support and recognize their efforts, SEMA holds a series of intensive Leadership Days events each year, with this year’s gathering held principally at the Sheraton Fairplex Conference Center in Pomona, California, July 24–25. On July 12, 2013, SEMA-member companies joined with SEMA staff and thousands of enthusiasts to celebrate the fourth annual Collector Car Appreciation Day (CCAD). Official events were held in the United States, Canada and Australia to commemorate the day, designated by a SEMA-requested U.S. Senate resolution. Sponsored by Sen. Jon Tester  (D-MT) and Sen. Richard Burr  (R-NC), the U.S. Senate resolution recognized “that the collection and restoration of historic and classic cars is an important part of preserving the technological achievements and cultural heritage of the United States.” Lawmakers in states, provinces, counties and cities have followed the Senate’s lead by adopting their own resolutions. This year’s participants included: Michigan; New Mexico; New York; Manitoba, Canada; Nova Scotia, Canada; Las Vegas, Nevada; Madera County, California; York County, Virginia; and Washington Parish, Louisiana. Breaking news from SEMA members, including Hotchkis Sport Suspension, RealTruck.com, MSD Performance, Design Engineering Inc., and more. The First-Time and Featured Exhibitors areas include hundreds of exhibitors representing a variety of market segments. To showcase the industry’s top trendsetting vehicle models, the SEMA Award will be announced and presented to winning automakers during the 2013 SEMA Show in Las Vegas, November 5–8, 2013. Through the program, SEMA exhibitors will identify the vehicle platforms they believe are best for accessorizing and ideal for showcasing their new products. Show organizers will take a tally of every booth vehicle at the Show to identify the most popular vehicle models in four categories: Hottest Car, Hottest Truck, Hottest 4x4-SUV and Hottest Sport Compact. With each booth vehicle representing one vote, the most prominent models will be named the SEMA Award winners for the year. One of the newest attractions added to the 2013 SEMA Show is Cars & Coffee–SEMA Edition. Showgoers can get a jump-start each morning from 8:00 a.m.–9:00 a.m. with a cup of coffee and some cool vehicles. Cars & Coffee—SEMA Edition will be located in the outdoor patio on the south side of the Las Vegas Hotel (LVH), which is adjacent to the Las Vegas Convention Center North Hall. Education and Logistical Help for Global Companies, International Vehicle Measuring Sessions, Make/Model Data, Attend International Seminars, Middle East Seminar, and more. Exporting automotive specialty-equipment products can allow U.S. companies to increase their customer bases for improved bottom lines, better position themselves to ride out possible future U.S. economic downturns, and increase overall competitiveness through access to new customers. Exporting leads to new ways of doing business, and SEMA supports the global efforts of its members through a series of targeted international programs. This is the second of a two-part series on SEMA programs and resources designed to assist members to grow their international sales. SEMA was recently honored with the Presidential Export Award —or “E” Award—from U.S. Acting Secretary of Commerce Rebecca Blank in Washington, D.C. The President’s “E” Award was created by President John F. Kennedy in 1961. “E” Awards were presented to a total of 57 recipients this year. Criteria for the award is based upon four years of successive export growth and case studies that demonstrate valuable support to exporters resulting in increased exports for the member company’s clients.